Dear Readers, as you will know the past few months have been pretty busy, what with my course and going to visit the parents and all. So I suppose it shouldn’t have been that much of a surprise to see a two-foot tall ash tree sapling poking through the red valerian beside the pond. Even so, it gave me pause to see the fish bone leaves and the charcoal-coloured leaf bud that looks for all the world like a deer’s hoof. The ash tree is both loved and loathed. 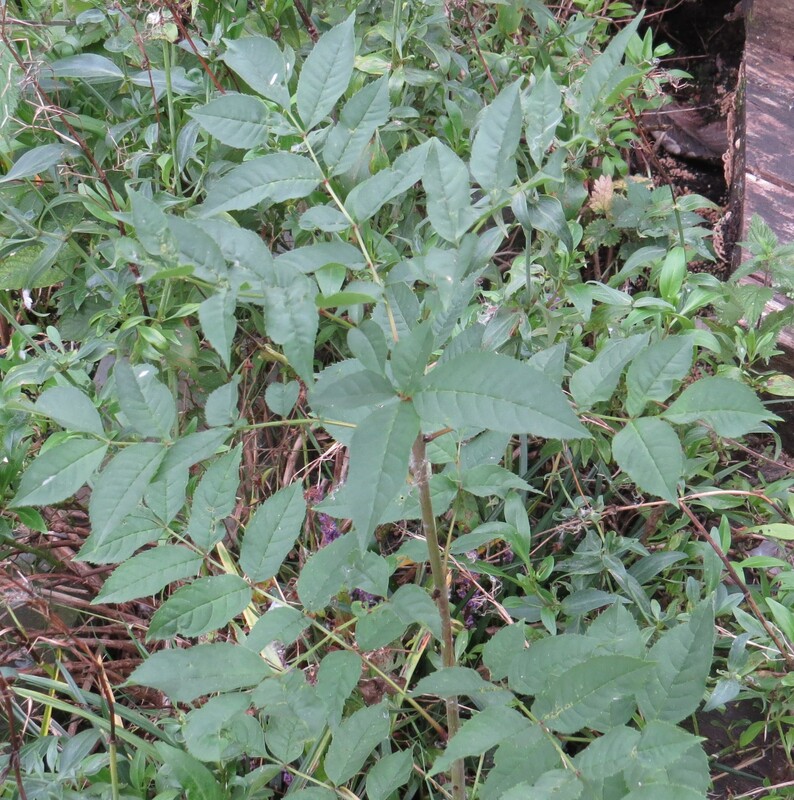 For foresters it has historically been something of a ‘weed tree’ on account of the easy way that the saplings colonise open ground, especially on damp soils. And yet, for Richard Mabey, and for me, it seems to be a healing tree in many different ways. Mabey points out that it is ash that filled the gaps left by the destruction of so many august trees during the storm of 1987. In St Pancras and Islington cemetery, it is ash that proliferates in the many damp and boggy places. And it was ash that filled the gaps left by Dutch Elm disease, something that is now horribly ironic as ash, in its turn, is menaced by disease, of which more later. Ash has also been used in healing ceremonies, right up to the end of the eighteenth century (and possibly even today). In Flora Britannica, Mabey reports on one such ceremony, recorded by Gilbert White. Ash was considered especially efficacious in the case of children born sickly, or with wasted limbs. A young ash would be split in two and the halves held open by wedges. The child would then be passed, stark naked, through the gap. The split tree was then plastered up with loam, and swathed up with bandages. If the two halves grew back together, the cure was said to have worked, but if the two halves remained separate it was considered ineffective. In Norse mythology, Yggdrasil, ‘the world tree’, is generally considered to be an ash (though some believe it might have been a yew). This was the tree of life, ‘the greatest and best of all trees. Its branches spread all over the world’. All the sadder, then, that it is diseases and creatures from other parts of the world that now form the biggest of challenges to this most widespread of British trees. 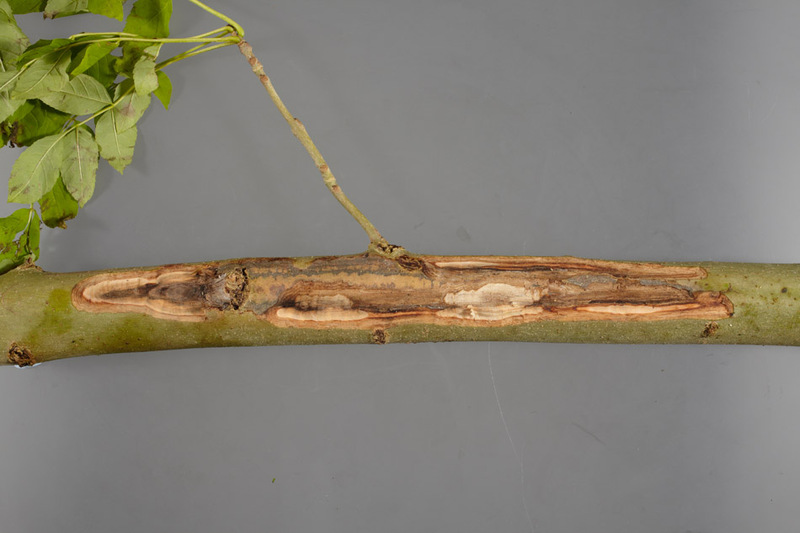 In 2012, a disease known as ‘ash dieback’, caused by the fungus Hymenoscyphus fraxineus was discovered in saplings in a nursery in Buckinghamshire. 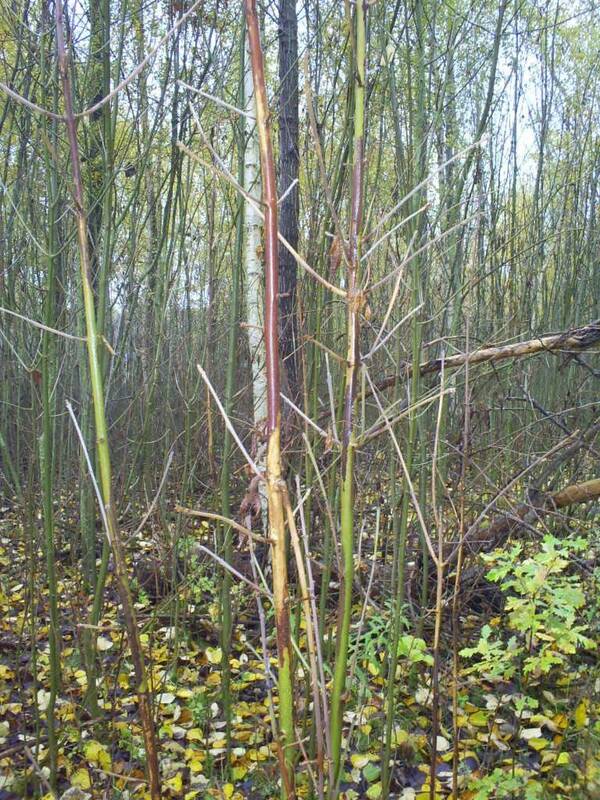 Although ash dieback is widespread in mainland Europe, killing up to 85% of the ash trees in Poland and devastating the tree in other places too, the UK had continued to import saplings from affected areas. By the time that the disease was recognised, it was already affecting full grown trees in woodland. 100,00 trees and saplings were destroyed, but scientists considered it ‘too little, too late’. 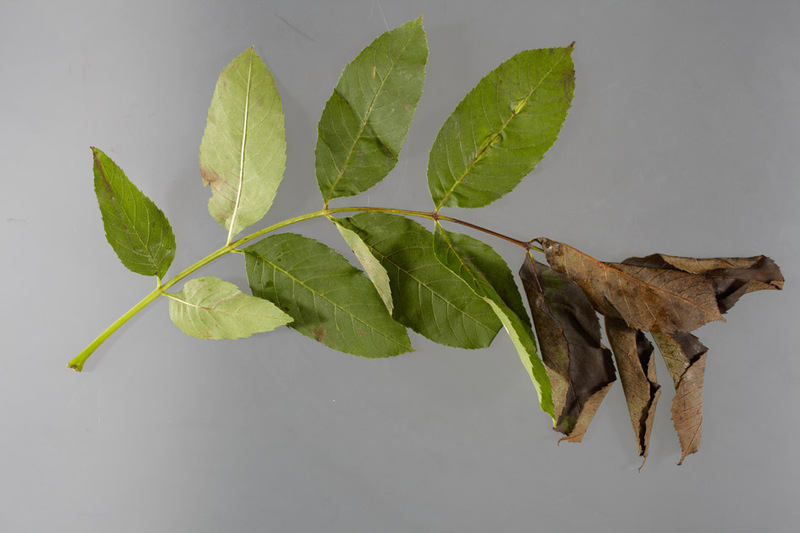 Some trees do have immunity to the fungus, but it is estimated that probably 95% of all British ash trees could be killed in the UK, out of a population of 80 million trees. So far, it has been found in 50% of all the 10k squares in England monitored by the Forestry Commission, 16% of those in Scotland and 30% of those in Wales. The first cases have also just been found in Northern Ireland, and the disease is well-established in the Republic of Ireland. The 2013 UK strategy, announced by Owen Paterson ( the comedy environment minister who claimed that the ‘badgers had moved the goalposts’ during the cull ‘discussions’ for those who don’t remember) was to allow adult trees with ash dieback to stand (because of their wildlife value, and the fact that immunity will never develop if trees are cut down immediately). 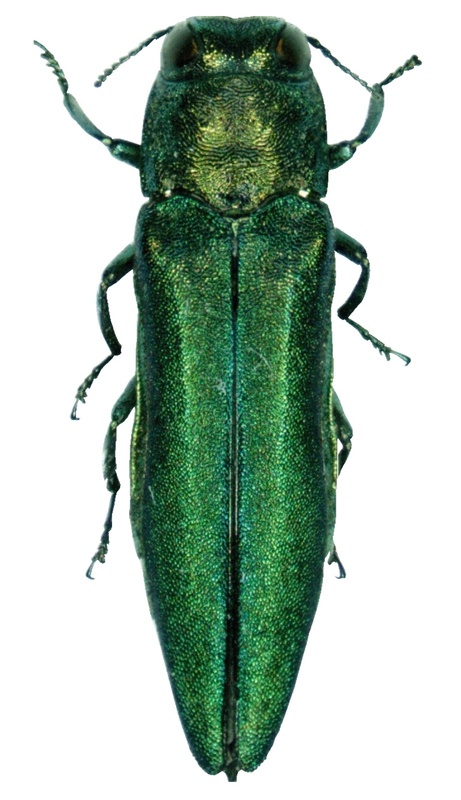 Young trees would be destroyed, and an additional 250,000 ash trees will be planted to see if the characteristics for immunity can be identified. There is also a monitoring scheme with an app called ‘Ashtag‘ which sounds like as much fun as can be mustered from the situation. 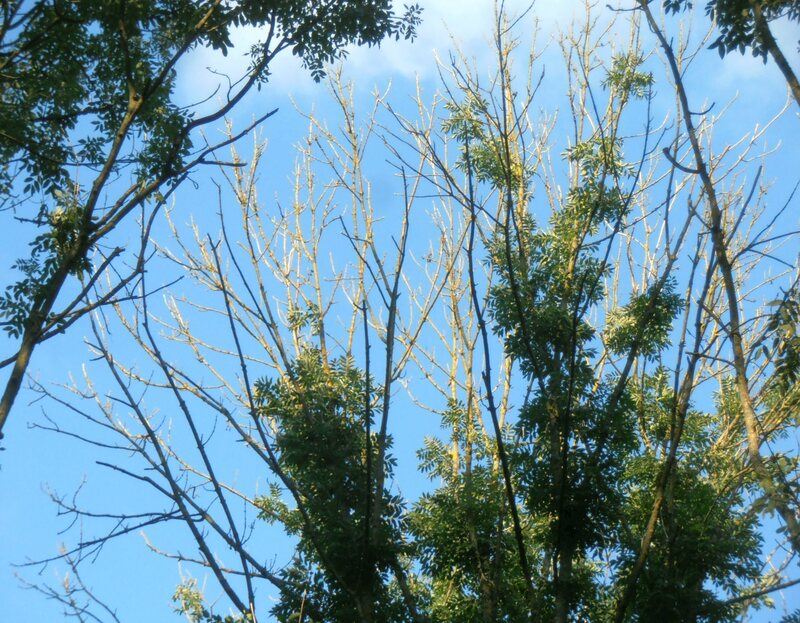 So, what does ash dieback look like? 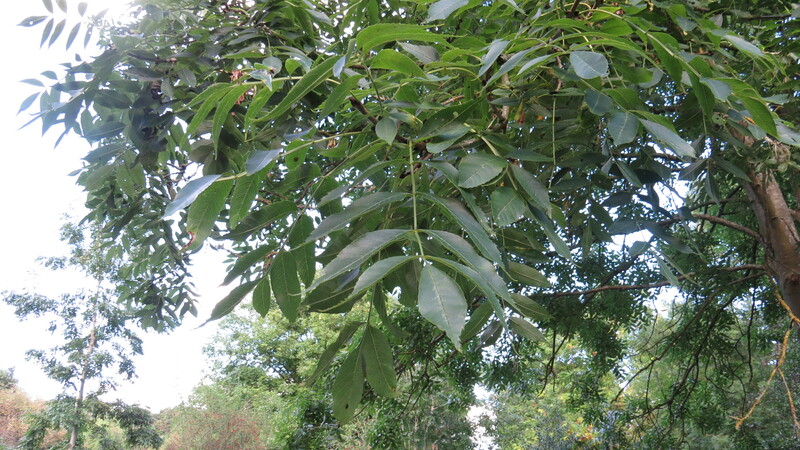 It causes the ‘dieback’ of stems and branches in the crown of mature trees (hence the name of the disease). 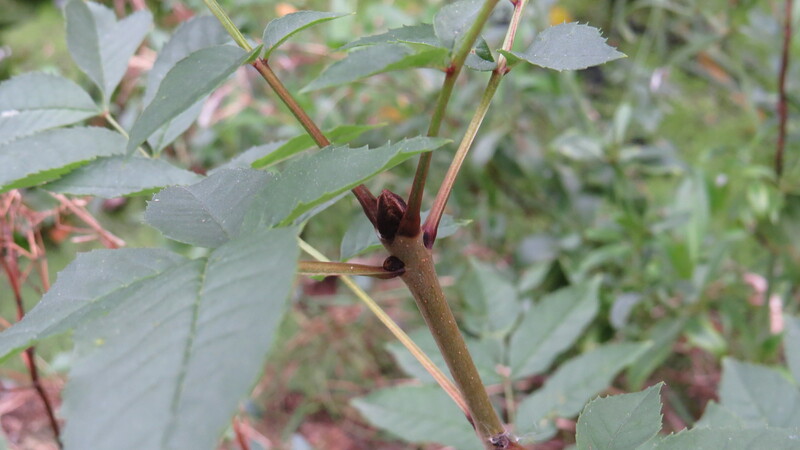 It also causes distinctive lesions on the stems and branches. And this is what the fruiting bodies of the fungus look like when they have finished their work in the tree. Ash dieback fungus (Hymenoscyphus fraxineus). Photo Five – credit below. So, it seems that the World Tree is under a greater threat than at any point in its past. Will it be able to come back? 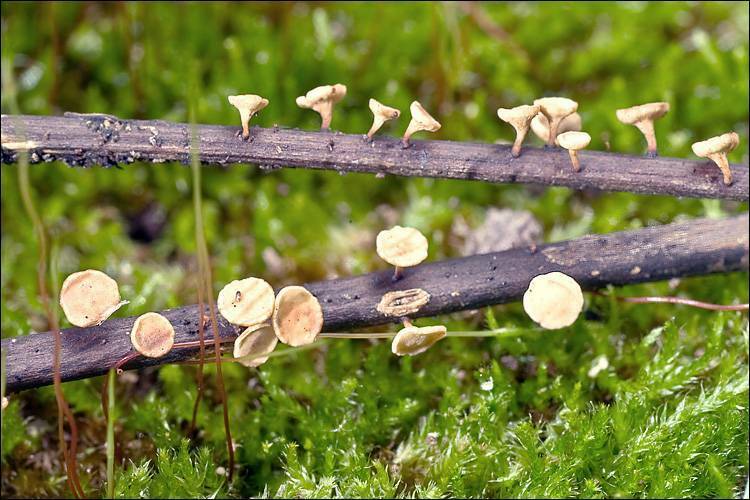 Will enough plants have immunity to the worst effects of the fungus? I would like to think so, but I suspect that the timescale of any resurgence will be far longer than my lifetime, and that of anyone else reading this blog. 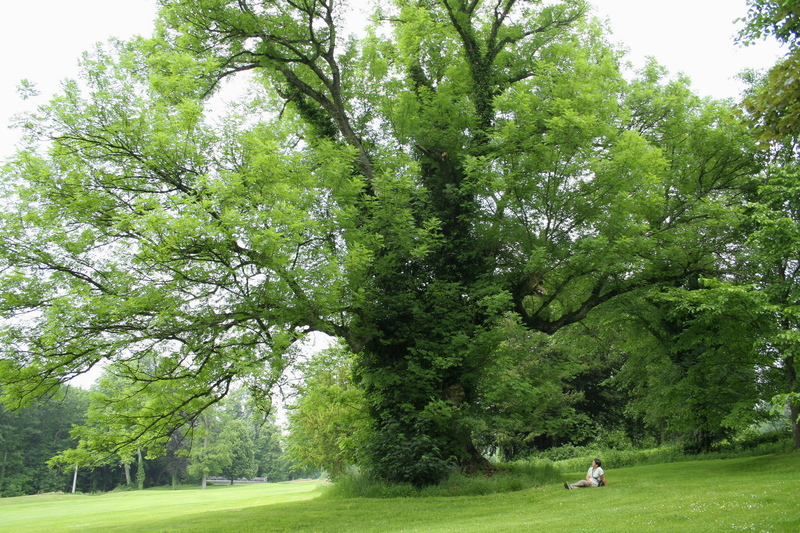 After all, elms have not made a return to the British countryside since they were all but annihilated by Dutch Elm disease in many areas in the 1960’s. There are glimmers of hope: the BBC programme Countryfile showed a report on the effect of using a particular kind of charcoal in the soil around ash trees in February this year. Twenty trees have apparently remained disease-free despite being in the middle of a group of infected trees for the past three years. Let’s hope that this continues – a soil treatment of this kind would be an environmentally friendly way to protect our ash trees. Sadly, there is one more threat that I have to mention, because although it isn’t here yet, it’s probably only a matter of time. Have a look at this little beauty, and commit it to memory. This is an Asian beetle which, in its home territory, causes no problems at all. However, it arrived in North America, probably as larvae in packing cases, and has been demolishing trees unhindered ever since. 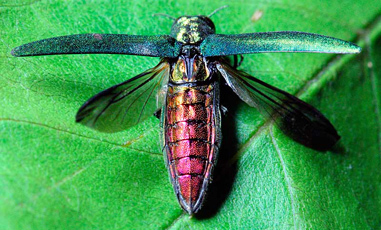 It seems unlikely to me to go unnoticed, as it is a particularly conspicuous-looking creature, even more so when it decides to take flight, whereupon it looks rather like me at a disco circa 1982. There are no other creatures like it in the UK so keep an eye open. All of which brings me back to my dilemma in the garden. Do I really want an ash tree growing next to the pond, however threatened they are? After all, these are substantial plants, which at their biggest can reach 141 feet tall. And I suspect it will be unhappy in a pot. I think this is one of those decisions that I’ll have to defer until I come back from my next secret trip, in which Bugwoman visits one of her favourite places on earth, in the company of a very intrepid 90 year-old lady. 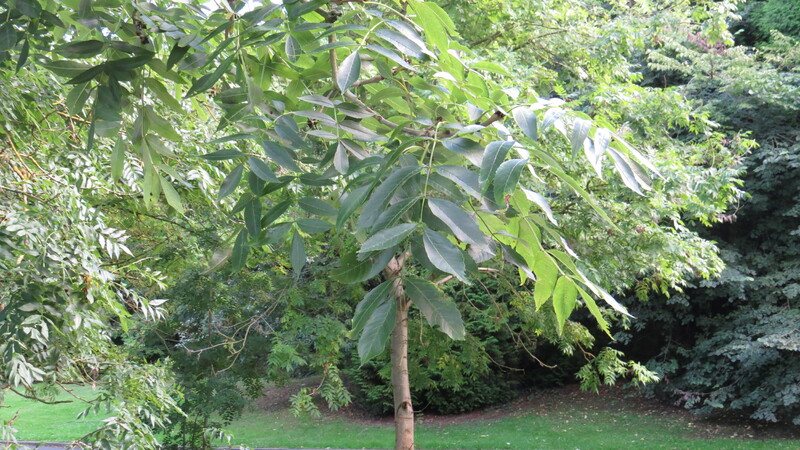 But more on this next week….until then, have a good look at any ash trees you meet. We can no longer take them for granted. All other images and text copyright Vivienne Palmer. Free to use and share, but please attribute and link back to the blog, thank you! This entry was posted in Uncategorized on October 15, 2016 by Bug Woman. It’s a worry isn’t it? ‘My’ Ash which is opposite my kitchen window still looks healthy enough (it is about twenty years old) so I am keeping my fingers crossed for it but I shall look for the signs soon. If you decide to keep yours, take out the top when it is a few years old and it won’t grow to such grand proportions though it might develop another main stem as mine has done, it still looks good though. What a beautiful beetle, but what a disaster it could be. Hi Toffeeapple, thanks for your advice! I’m thinking at the moment that I shall transplant the ash towards the back of the garden, and then carry on as you suggest – if I leave it where it is, I fear that its roots will grow through the lining of my pond, which would be a bit disastrous…. If you do as Toffeeapple suggests and take out the top, you can prune it each year by sawing off the largest sub-stem(s) and any awkward side-shoots, almost like pollarding a willow, although you need not be too severe and can leave a few stems here or there. You will keep it reasonably small that way, so don’t rip the poor thing out, just keep it in check. Having said all this, I hope yours is a disease-free specimen, else keeping it would be a bad idea. Hi Baldwin, I think I’m going to gently transplant it to the back of the garden, and then do as you suggest – if I leave it where it is, I fear the roots will grow through my pond lining. It does look healthy at the moment, so I shall keep my fingers crossed! Transplanting should work; they are not really delicate plants, are they? And I certainly appreciate your point about the liner, so good luck. Thanks, Baldwin! No, delicate is not a word that springs to mind, and I shall be very careful. I shall keep everyone posted. The park in which I walk every day is full of Ash trees and so far they seem to be unaffected. I love the different seasons of the Ash – the broccoli-like flowers and huge clumps of seeds. They are gorgeous trees, and all the more beautiful for being in peril. I hope that your trees remain unaffected, Andrea. I suspect that transplanting might be done when dormant. Mine is currently shedding leaves with each breath of wind and I look forward to the time when the Gold Finches come to eat the seeds. Good idea, Toffeeapple. I shall wait until the leaves have dropped off.